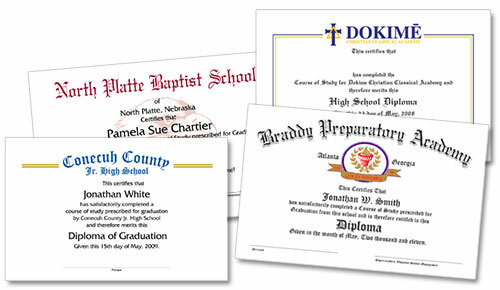 ALL CATHOLIC DIPLOMAS, LUTHERAN DIPLOMAS, AND OTHER CHRISTIAN SCHOOL DIPLOMAS ARE HAND FOILED AND PRINTED IN THE UNITED STATES. Graduation Ink provides three different diploma styles for Christian school diplomas that will save time, money, and hassle for the school. They are the Series 250, Series 300, and Series 500 diplomas. These products include Catholic diplomas, Baptist diplomas, and Lutheran diplomas. Because of our unique process, Catholic diplomas, Lutheran diplomas, Baptist diplomas, and other Christian diplomas can be ordered in larger quantities to lower the overall diploma cost. 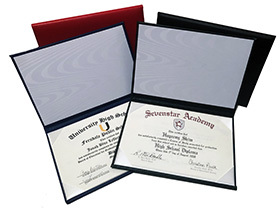 On the Series 300 and Series 500 diplomas, the Christian diploma sheets are pre-printed in with the school logo or mascot and school name. The graduate's name is not included in the printing process (unless specifically requested). Instead, we provide a template that has been formatted specifically for your Christian school so that an office assistant can feed the sheets into the printer and enter the student name/date to complete the diploma personalization. 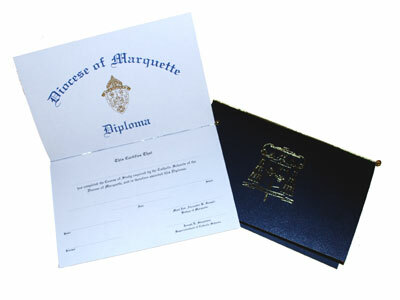 The Series 250 Christian school diploma pricing does, however, include a fully personalized diploma sheet. T he Series 250 Christian School Diploma from Graduation Ink is specifically designed with parochial elementary schools in mind. This top of the line, fully personalized diploma is even excellent for Lutheran diplomas, Baptist diplomas, and Catholic diplomas. The diploma cover has a leatherette-feel and includes a gold brushed plate and the school name hot-foiled under the plate in gold or silver. 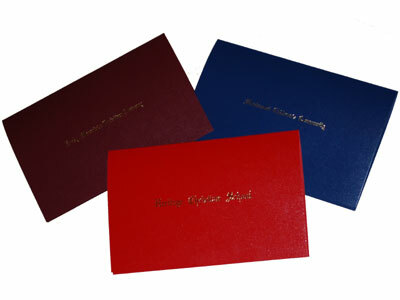 The diploma covers are available in black, blue, green, red, and purple. The 8½”x11” gray parchment diploma sheet is printed on the top half with a blue/orange lamp of learning. Included is the Scripture verse, “Teach me knowledge and good judgment, for I believe in your commands” Psalm 119:66. Surrounding the diploma sheet is a second translucent sheet. This sheet may be personalized with your class verse, hymn, motto, flower, song, colors, etc. The sheets are held in place with a gold or silver pawl (elastic cord). Graduation worship bulletins that match the diploma sheet also available on request. Cover colors may not appear exact on different computer monitors. The Series 300 Christian School Diploma is printed in two colors on a contemporary, speckled paper. 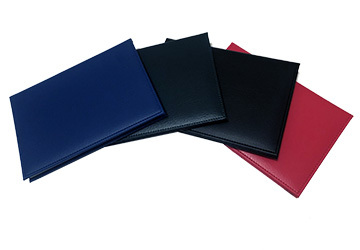 The diploma cover is constructed of an attractive leatherette material that is available in black, blue, green, red, and maroon. Every diploma is imprinted by hand in gold or silver foil with the school name or a lamp symbol. All Series 300 school diplomas include a gold or silver pawl (elastic cord). Note: The majority of our Catholic diplomas have been Series 300. The Series 500 style diploma is excellent for Catholic diplomas, Lutheran diplomas, Baptist diplomas, and other Christian schools. The diploma sheet is printed on an ivory cover-stock paper. 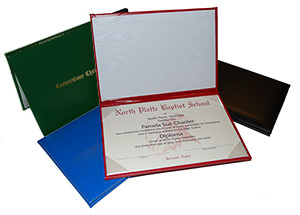 The Christian school diploma cover is crafted of a fully padded leatherette material. There is a white moire panel on the interior. The diploma cover is hand-foiled with the school name in gold or silver. 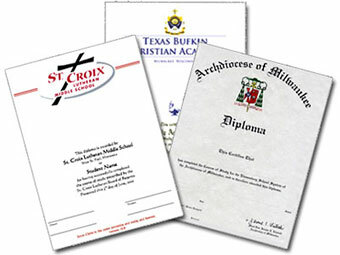 Diploma sheets are designed to the specifications of your Lutheran diplomas, Catholic diplomas, Baptist diplomas, or other Christian school diplomas. The sheets are held in place with four silk corners. GRADUATION INK "CHRISTIAN SCHOOL DIPLOMAS: CATHOLIC DIPLOMAS/LUTHERAN DIPLOMAS"